Bombs were the primary strike weapon of aircraft. They were usually iron containers of high explosive with an aerodynamic form to reduce drag and improve accuracy. However, there was increasing variety in the kinds of bombs carried by strike aircraft as the war progressed. Light bombers typically carried a single bomb weighing up to half a ton, though some could carry a number of smaller bombs. Medium and heavy bombers could carry several large or many small bombs in their bomb bays, with a total weight of up to two tons for a medium bomber and as much as 20 tons for the heaviest bombers flying at short range and low altitude. By the end of the war, light bombers and some fighter aircraft were capable of carrying up to a ton of bombs. General-purpose or demolition bombs had thin metal walls, a large explosive charge, and a contact fuse that was triggered by a relatively light impact. Such weapons were effective against soft targets, which included unarmored ships, infantry in the open, and most civilian installations. The Japanese D3A "Val" usually carried the Type 99 Number 25 Model 1 Ordinary general-purpose bomb, which was designed for attacks on unarmored or lightly armored ships. This bomb weighed 250kg (551 lbs) of which about 62 kg (136 lbs) was high explosive. Its fuse was initiated by impact on ordinary steel plating and had a 0.2 second delay. This allowed the bomb to penetrate 20 to 40 feet (6 to 12 meters) before detonating. However, it had a somewhat high dud rate, with perhaps 27% of those used at Pearl Harbor either failing to detonate or giving low-order detonations. Australian troops at Rabaul in January 1942 also reported a high dud rate. Its American counterparts were fused to detonate after just 0.1 seconds in order to tear up carrier flight decks. The Americans estimated that three hits with 500 lb (227 kg) GP bombs would almost certainly sink a 1630-ton destroyer and had a 70% chance of sinking a 2100-ton destroyer. Three hits with 1000 lb (454 kg) GP bombs had a 95% chance of sinking a relatively lightly protected Atlanta-class light cruiser and a 30% chance of sinking a 10,000-ton heavy cruiser. Six hits with the 1000-lb bomb gave a 80% chance of sinking a heavy cruiser. Nine Allied cruisers were sunk by general-purpose bombs during the Second World War. A single bomb hit required an average of six to seven weeks in a shipyard to repair, and a particularly damaging hit (such as the 500kg or 1100 lb hit on British cruiser Suffolk that forced her to beach) could take up to eight months to repair. 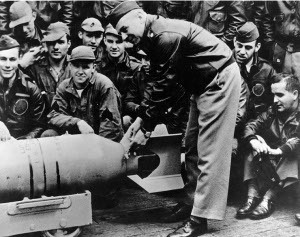 Although general-purpose bombs could not be expected to inflict critical damage on heavily armored battleships, they could be effective for suppressing antiaircraft fire against coordinated light bomber attacks. The Americans concluded that a 250 kg bomb hit amidships on a battleship could knock out most of the antiaircraft guns, and after the Pearl Harbor attack, high priority was placed on installing shields and gun tubs around these guns to provide splinter protection. The U.S. Naval War College estimated in March 1940 that twelve fighters armed with two machine guns and two 100-lb (45 kg) bombs could knock out 30% of a ship's antiaircraft fire for a day, while six strafing fighters would reduce antiaircraft by 50% against any attack that immediately followed the fighters. This estimate was revised downwards to three fighters in June 1944 to reflect the more powerful 0.50 machine gun armament on modern fighters. Against industrial targets, a single Type 99 bomb might be expected to destroy an area of about 4400 square feet (409 m2). To give some idea of what this meant in practice, it would have taken almost 5000 Type 99 bombs dropped in a perfect pattern to completely destroy the Pearl Harbor Navy Yard. The difficulty of destroying factories with high explosives became clear during the strategic bombing campaign in Europe and helps explain the change to the use of incendiaries against Japan. To cut up aircraft on the ground we had wrapped these bombs with heavy steel wire, and dropped them with instantaneous fuses on the end of a six-inch pipe extension in the nose. They looked good. The wire, which was nearly one-quarter inch in diameter, broke up into pieces from six inches to a couple of feet long, and in the demonstration it cut limbs off trees a hundred feet away which were two inches thick. The noise was quite terrifying. The pieces of wire whirling through the air whistled and sang all of the notes on the scale and wailed and screamed like a whole tribe of disconsolate banshees. Another variant of the general-purpose bomb was the high capacity or light case bomb, which had the thinnest possible case and largest possible explosive charge. These required a light contact fuse with instantaneous detonation, since the case would buckle on hitting even the lightest surface. These were used primarily in Europe as "block buster" bombs for destroying large areas of cities. Armor-piercing bombs had thick steel cases, a relatively small explosive charge, and a delayed fuse that did not detonate the explosive until a few tenths of a second or more after the bomb hit a substantial solid surface. This gave time for the bomb to penetrate before detonating. AP bombs were useful against armored ships, bunkers, concrete runways, and other hardened targets. The Japanese apparently did not develop an armor-piercing bomb until 1941. The Type 99 Number 80 Mark 5, used at Pearl Harbor, was remanufactured from obsolete 16" battleship shells. Out of a total weight of 800 kg (1760 lbs), the bomb had a charge of just 23 kg (50 pounds) of Type 91 explosive. The Type 99 had two base fuzes with 0.2 second delay that were insensitive enough to require impact on armor plate for fuze initiation. One such bomb went clear through Vestal at Pearl Harbor to explode on the harbor floor under the ship. The Type 99 was judged capable of penetrating 5.75" (146mm) of deck armor when dropped from a height of 10,000 feet (3000m). Unfortunately for the Japanese, the Type 99 had a high dud rate, due to weaknesses in the bomb case introduced during the remanufacturing process and poor quality control with the explosive fill. Of those that scored hits at Pearl Harbor, 20% failed to explode and another 40% yielded only low order explosions. 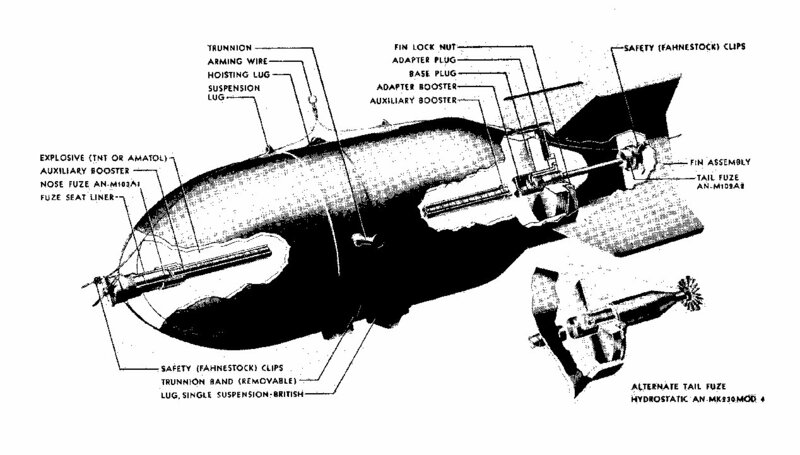 The Japanese never developed an armor-piercing bomb light enough to be carried by a dive bomber, probably because they did not believe it was possible to develop a lighter AP bomb capable of penetrating battleship deck armor, and possibly also because of the shortage of the high-quality steel required for such weapons. The Americans began the war with armor-piercing bombs that closely resembled the Type 99 Number 80 Mark 5. These came in four models varying in weight from 1000 lbs (454 kg) to 600 lbs (272 kg). 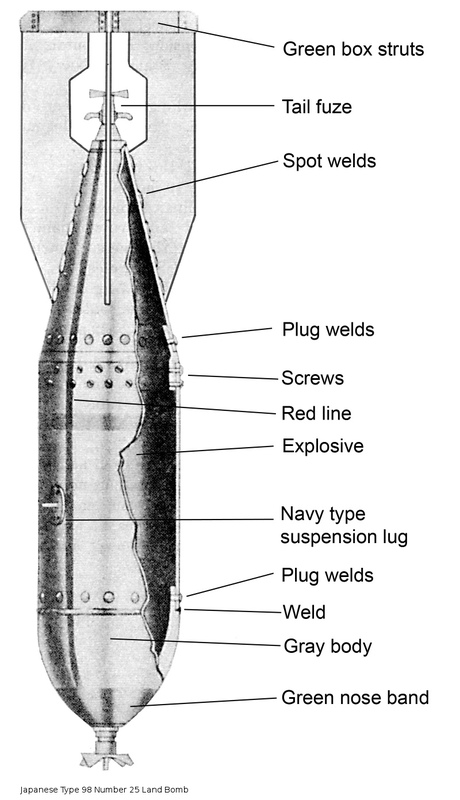 Like the Type 99, they were converted shells with a relatively small explosive fill (typically about 5% of the total weight) of ammonium picrate. However, in May 1942 the Americans introduced the AP Mark 1, which weighed 1600 lbs (726 kg) of which 240 lbs (109 kg) was high explosive. 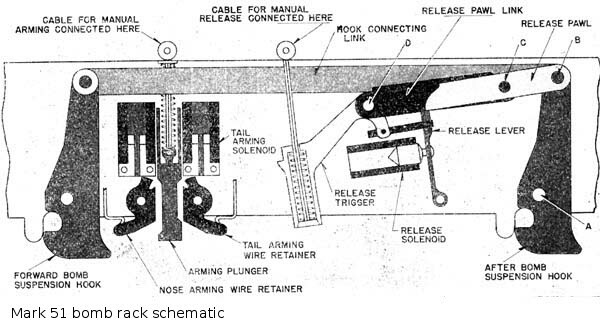 The Mark 1 could penetrate a 5" (13.7cm) deck from 7500' (2900m) or from 4500' (1370m) in a 300 knot 60 degree dive. This bomb was so heavy that only the TBF Avenger or SB2C Helldiver was capable of carrying it, and it was rare for a carrier to have more than 20 Mark 1 bombs in its magazine. Much more widely used was the Mark 33, introduced in October 1942, which weighed 1000 lbs (454kg) of which 150 lbs (68 kg) was high explosive. The Mark 33 could penetrate a 5" deck from 10,000' (3050m) or from 6500' (1980m) when dropped from a dive bomber in a 300 knot 60 degree dive. 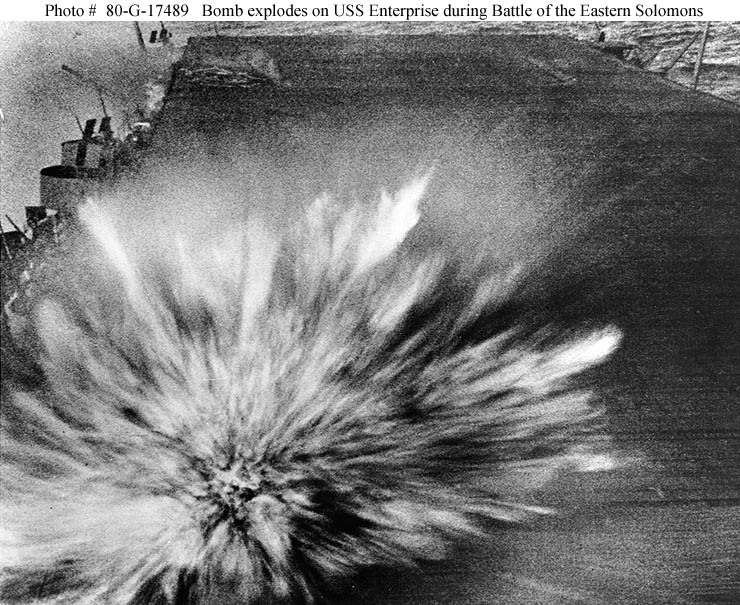 The Americans estimated that seven penetrating bomb hits would be enough to sink a battleship, while the Japanese estimated that 12 to 16 penetrating hits were required. American operational analysts later revised their estimates, concluding that the Mark 33 could sink a battleship only if it hit a magazine, which worked out to a 79% chance of sinking a battleship with six penetrating hits. Semi-armor-piercing bombs were a compromise between the penetrating ability of an armor-piercing bomb and the large explosive charge of a general purpose bomb. They were useful against lightly armored ships and reinforced concrete structures. Incendiary bombs were filled with a flammable material in place of explosive. Early incendiaries were filled with oil, gasoline, magnesium, or thermite, but it was discovered during the Battle of Britain that such weapons were fairly easy to deal with in isolation if firefighters were close at hand. Incendiaries were therefore typically dropped together with demolition bombs, which smashed structures into kindling while suppressing firefighting efforts. Both sides indulged in the practice of dropping demolition bombs into areas already on fire from incendiary attack, which produced heavy casualties among firefighters. In many cases, this was done simply because the fires were convenient aiming points during night bombing missions. The Americans discovered that a mixture of napthalenic and palmitic acids (fatty acids similar to those present in soap) could be added to gasoline to turn it into a gel that adhered to whatever it hit and burned longer than plain gasoline. The resulting incendiary mixture, napalm, was highly effective and remained in widespread use until late in the 20th century, when precision bombing technology and increased concern for collateral damage cast incendiaries into disfavor. The napalm bomb used to burn down the cities of Japan was the M-69, which weighed 6.2 pounds (2.8 kg) and was dropped in clusters of sixty that were designed to burst apart at a designated altitude. Each M-69 trailed a three foot (1 meter) cloth strip that slowed the bomb and stabilized its descent. A few seconds after the bomb hit a solid surface, a small charge went off, spreading the napalm as much as 100 feet (30 meters) and igniting it. Airburst bombs came into use just as the war was winding down. During the final carrier raids on Japanese naval bases in the home islands, in July 1945, a number of carrier bombers were loaded with fragmentation bombs carrying radar proximity (VT) fuses so that the bombs would explode just above the decks of naval vessels. It was hoped that these weapons would be highly effective at suppressing the antiaircraft battery of the target ship, but pilots participating in the raid reported heavy antiaircraft fire in spite of their use. The nuclear weapons dropped on Nagasaki and Hiroshima were also radar fused to yield an air burst at an altitude calculated to inflict maximum devastation. Other bomb types included depth bombs (discussed in the article on depth charges), practice bombs, chemical bombs, and illuminating bombs. The later were used at night to illuminate a battlefield or bombing target and generally resembled illuminating shells. Delivery. Practically all the bombs used in the Second World War were what are now called gravity bombs. They had no active guidance mechanism, and bombardiers were trained to steer the aircraft towards the target and release the bomb at just the right moment so that its free fall trajectory took it into the target. This was not a very accurate procedure, even with sophisticated computing bomb sights such as the American Norden bombsight, which both steered the aircraft towards the target and computed the exact moment of release. Costing $5000 each in 1927, the original Norden claimed an accuracy of 110' (34m) from 6000' (1800m). The bombardier entered speed, altitude, temperature, and barometric pressure into the bombsight, then centered the crosshairs of the aiming telescope on the target. The bombsight automatically adjusted the aim of the telescope, and the bombardier made subtle corrections to the autopilot until the target appeared stationary in the crosshairs. The bombsight used a pair of gyroscopes to stabilize the bomb run and automatically released the bomb load when the correct calculated release point was reached. The Norden was remarkably accurate, but only in perfect weather on a test range with a clearly marked target and with a bombardier who was undisturbed by enemy fire for the last 45 seconds or so of the bomb run. Under actual combat conditions, accuracy varied from fair to dreadful. The Japanese had nothing better than a revised German Boyco sight and relied on exquisitely trained bombardier-pilot teams for accuracy in horizontal bombing. The best Japanese aircrew could hit a stationary target ship about a third of the time. Dive bombing was developed in part to improve the accuracy of bombing. Because the bomb was released on a trajectory much closer to that of the aircraft itself, range error (error along the flight path) was greatly reduced. The Germans experimented with radio-guided bombs with some success. The Japanese Kamikazes were, in some sense, guided bombs. 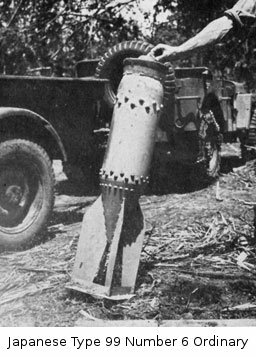 The only non-gravity bombs used extensively by the Allies in the Pacific were parafrag bombs, which proved highly effective against aircraft revetments. 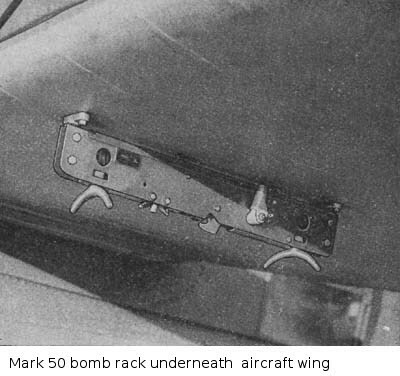 The Mark 57 Bat was an antishipping glide bomb equipped with an active radar homing mechanism, but it was introduced very late in the war, saw little service, and proved highly susceptible to ground clutter near shore. AZON (for Azimuth Only) was a tail fin package that could be attached to 1000 lb (454 kg) or 2000 lb (907 kg) general-purpose bombs as the VB-1 and VB-2. It included a gyrostabilizer to keep the bomb from rotating, a high-brilliance flare to allow the bombardier to easily track the bomb's trajectory, and radio-controlled fins that maneuvered the bomb in azimuth. A bombsight was still required with AZON since there was no guidance in range. AZON was used with some success in Burma to destroy bridges, which were notoriously difficult targets. Seven bridges were knocked out in fourteen missions by B-24 Liberators carrying AZON. Another specialized form of antishipping attack was skip bombing. This was conducted at low level by aircraft equipped with multiple forward-firing machine guns. An aircraft would saturate the target with machine gun fire during its approach to suppress antiaircraft fire, then drop its bombs, which were equipped with delayed fuses. When the bombs were dropped at the correct speed and altitude, they would skip along the surface of the water and hit the target ship at the waterline, then sink below the surface to explode seconds later with the same devastating effect as a torpedo or mine. Skip bombing was invented by the British prior to war and was employed by the RAF beginning in 1940. Arnold learned about the tactic in 1941, but Kenney may have invented the tactic independently in the Southwest Pacific. Skip bombing was first employed in the Pacific at the Battle of the Bismarck Sea, where the Japanese assumed that aircraft approaching at low level were going to drop torpedoes. The ships turned into the attack, which left them highly vulnerable to skip bombing. The Japanese began experimenting with skip bombing by Zeroes armed with 250 kg (551 lb) bombs in mid-1944, but the experiments were abandoned in favor of kamikaze tactics. 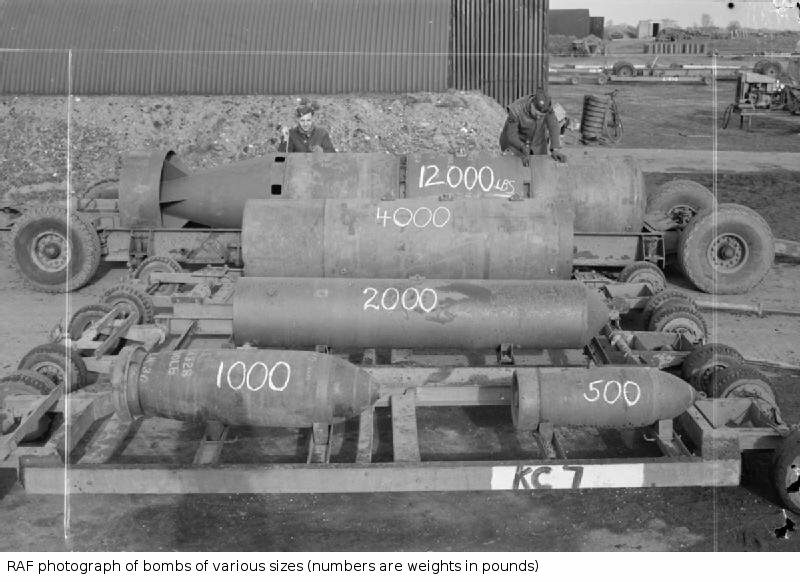 The British developed "bouncing bombs" especially for skip bombing attacks, and these were used in the famous "Dam Buster" raids to damage several dams in Germany's Ruhr Valley. The bombs were designed to to be given a rapid spin before being dropped, which improved their trajectory and ensured that the bombs would rapidly descend any vertical surface they struck. The British standardized a smaller version of the "bouncing bomb", Highball, and had plans to use Highball against the Japanese warships anchored at Singapore to thwart torpedo nets. However, the war ended before the attack could be carried out. According to Friedman (2013), the U.S. experimented with toss bombing during the war. In a toss bombing attack, the aircraft released the bomb during a high-speed climb, giving it an initial upwards trajectory. Because the aircraft never has to point directly at the target, it is less vulnerable to antiaircraft fire. However, a special bomb director is required to calculate the curved trajectory and determine the moment of release, and I have found no accounts of operational use of the tactic during the war, suggesting that such a director was not available in the field prior to the Japanese surrender. The Japanese developed a variant called swing bombing, in which the aircraft released the bomb while making a tight turn, and this may have seen some use in the war. 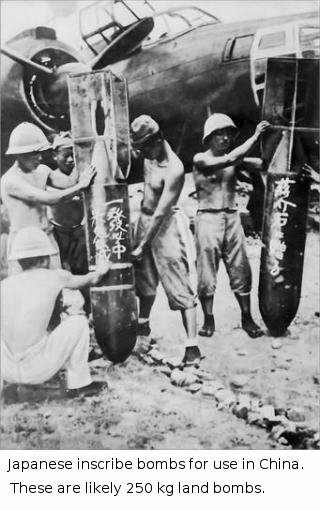 The Japanese Navy classified bombs as land attack, ordinary, and special bombs. 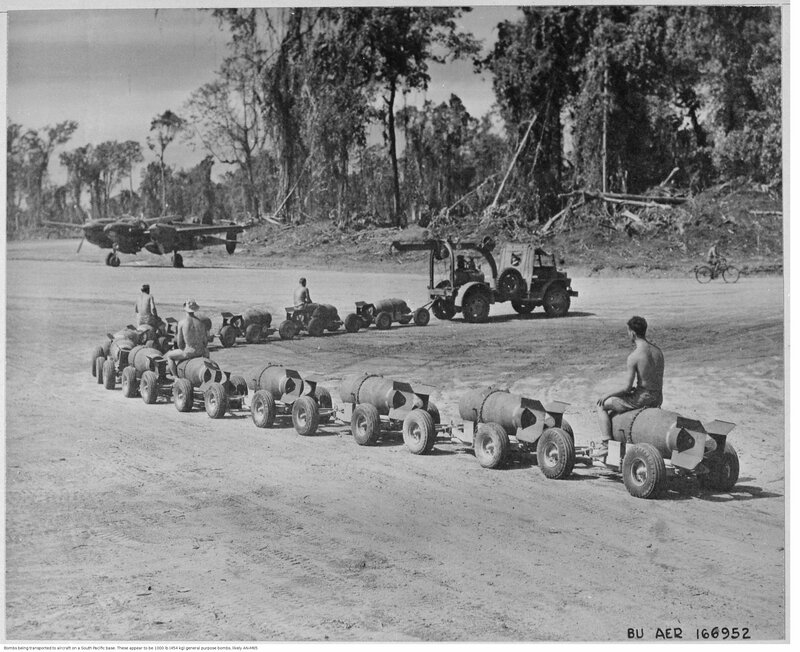 Land attack bombs were relatively cheaply manufactured bombs designed for use against ground targets while ordinary bombs were more carefully manufactured and were intended for use against shipping. However, the distinction was not sharp and both would have been described by the Americans as either general purpose or armor piercing bombs. Special bombs included antisubmarine bombs, air-to-air bombs, cluster bombs, certain armor-piercing bombs, and chemical bombs. The Japanese Navy designated bomb designs by type (year introduced to service, with 1939 being Year 99 and 1940 being Year 0), number (which the approximate bomb weigh in tens of kilograms), model (for major types) and modification (for minor changes). Thus the Type 99 Number 25 Model 1 Ordinary was a bomb brought into service in 1939 that weighted approximately 250 kg (551 lbs) and was the first antishipping bomb design adopted that year. Special bombs used Marks in place of Models, so the Type 99 Number 80 Mark 5 was a special-purpose bomb (in this case, armor-piercing) weighing 800 kg (1760 lbs) and introduced in 1939. 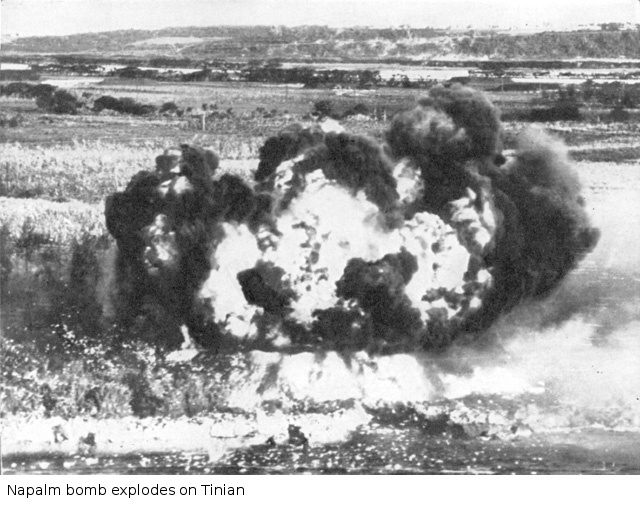 Bomb fill was typically either Shimose (picric acid), Type 91 (trinitroanisole), or Type 98 (70% trinitroanisole, 30% hexanitrodiphenylamine). Type 91 was considered particularly insensitive. Number 80 bombs were too heavy to be carried by dive bombers and were intended for delivery by torpedo bombers and fast attack bombers. The Number 50 bombs were too heavy for the D3A "Val" but could be carried by the D4Y "Judy". Most common Navy bomb. Capable of penetrating 8" (20 cm) of reinforced concrete. Differed from Type 97 Number 6 Land in details of construction. Angle fins rotate bomb to 1000 rpm, at which point the submunitions are expelled. Capable of penetrating 16" (40 cm) of reinforced concrete. More rugged construction than Type 98 Number 25 Model 1 Land, with thicker case. Mod 1 relaced Shimose with Type 98 explosive. Capable of penetrating 16"(40cm) of reinforced concrete. Used by torpedo bombers acting as horizontal bombers at Midway. Capable of penetrating 1" (25mm) armor plate. Gave effective fragmentation. Obsolete but still in use throughout the war. Capable of penetrating 3.1" (80mm) armor plate, making it an armor-piercing bomb by American standards. Model 1 and Model 2 had different fusing. Mod 1, 2, and 3 of each model had Shimose, Type 91, or Type 98 explosive fill. Capable of penetrating 2.8" (70mm) armor plate. These were the largest bombs in the Japanese Navy inventory. Gas was scattered over a 10 meter radius with a Shimose or Type 98 burster charge. Mark 3 Persistent Gas was described as a "thick yellowish green liquid" and was probably a mustard gas. 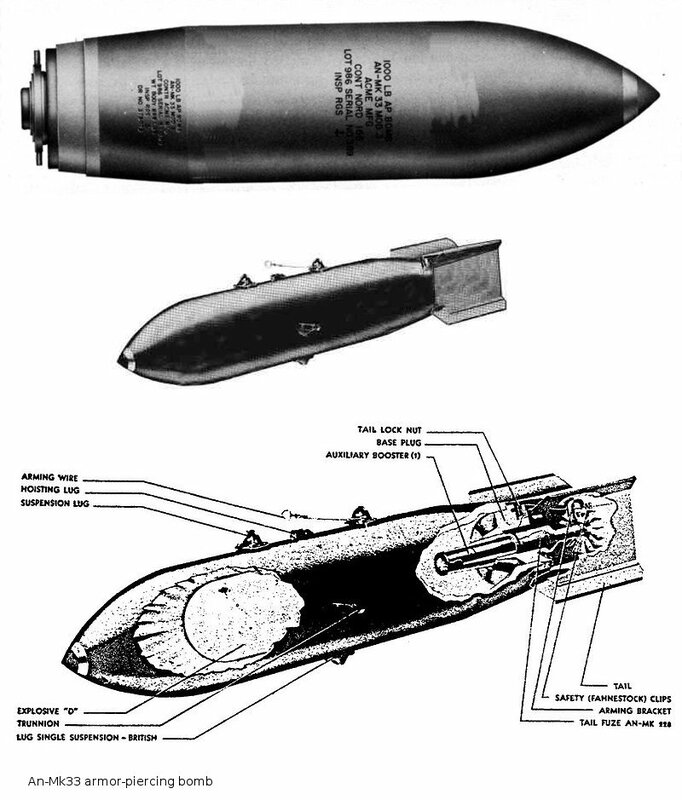 The Type 1 Model 4 was an improved version of the bomb with wider dispersion. Equipped with antiskip nose ring. Believed effective to 4-5 meters radius. Made of nonmagnetic materials (wood and fiber) for use with magnetic anomaly detectors. Effective radius about 8 meters. Effective radius about 10 meters. Equipped with antiskip nose ring. Angled fins rotate bomb to arm fuse for burster, which throws the pellets outwards and downwards. Intended for attacks on bomber formations. Not effective in practice: Allied intelligence judge the effect to be similar to a heavy antiaircraft shell, but the number that could be delivered by aircraft was much smaller than the number of shells that could be delivered by conventional antiaircraft guns. 144 white phosphorus pellets Similar to Type 99 Number 3 Mark 3 Special but with clockwork fusing. 780 incendiary pellets consisting of steel pipe containing a mixture of 50% aluminum powder and 50% barium nitrate. An experimental modification with smaller but more numerous pellets did not reach operational use during the war. This was a rocket bomb, accelerated by 90 m/s and thought capable of penetrating 5"-6" (125mm-150mm) armor plate. Converted from 16" (400mm) armor-piercing shells and used in the attack on Pearl Harbor. Capable of penetrating 6" (150mm) armor plate. Similar to Type 99 Number 80 Mark 5 Special but with a larger explosive charge. Capable of penetrating 8" (20 cm) of concrete. The incendiary pots likely were magnesium alloy ("electron") tubes filled with thermite. These burned for about four minutes. A bursting charge dispersed the pellets to a radius of 80 meters, and the pellets burned for about 20 seconds. The Mod 1 had 180 larger pellets. Neither model worked well because the dispersion and burning times were insufficient. Designed for skip bombing, with a skip distance of 150-250 meters. Designed for skip bombing with a skip distance of 150-300 meters. Fitted with airburst fuse to disperse submunitions over the target area. Equipped with nose ring and tail plate to limit ground penetration to about 1m and a time fuse. Air-to-air rocket bomb. Maximum velocity 270 m/s. Timed detonation released the incendiary iron pellets over a 60 degree arc. A number of similar designs seem not to have seen operational use. 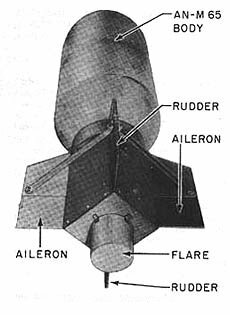 Airburst bomb based on a very unreliable radar proximity fuse meant to explode the bomb at 3-15 meters above ground level. Fitted with a tail impact fuse to detonate the ~50% of bombs whose proximity fuses failed. Produced flame and smoke for 30 minutes. Reported to have been used extensively the last two years of the war. Equipped with a pull igniter and dropped by hand from an aircraft. 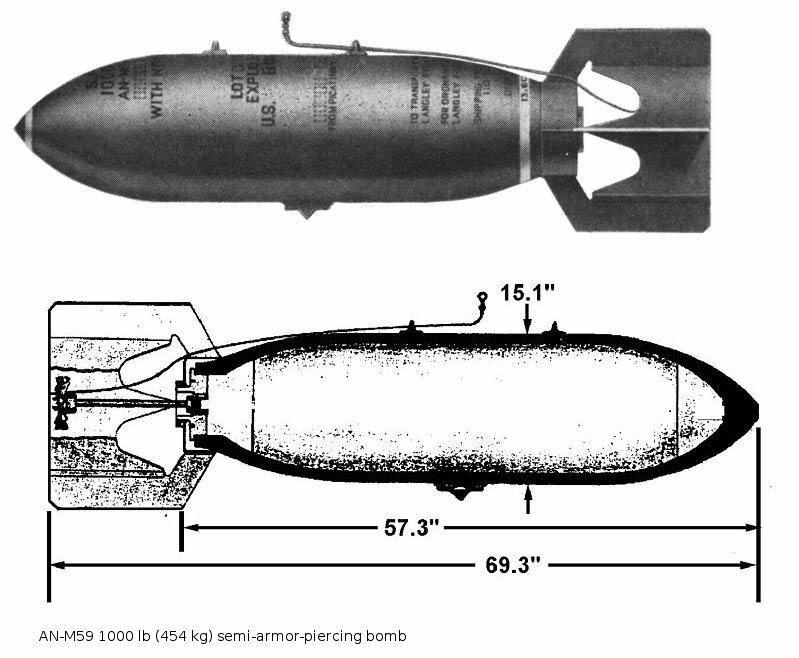 Japanese Army bombs included a bomb similar to the Number 50 Model 2 that also came in a skip bomb version, and possibly their own version of the Type 3 Number 80 Mark 8 skip bomb. American bombs came in a wide variety with a number of field improvisations. However, the major types are listed in the table below. 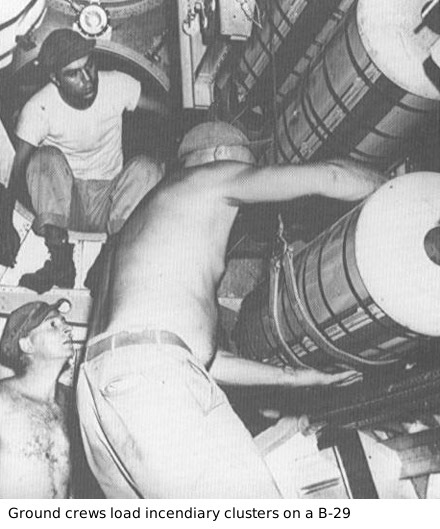 Bombs with an AN designation were "Army-Navy" bombs intended for use by both services. Ammonium picrate (Explosive D) was favored for armor-piercing projectiles because of its great insensitivity. Other bombs used TNT, sometimes in combination with ammonium nitrate (Amatol) or RDX. Tetryl was used as a booster in conventional bombs or a a burster in chemical bombs. Torpex was a mixture of RDX, TNT, and powdered aluminum favored for mines, torpedoes, and depth charges. Converted from naval shells. Obsolescent by 1943. Introduced May 1942. Capable of penetrating 5" (127mm) deck armor from a 4500' (1370m) in a 300 knot 60 degree dive. Too heavy for delivery by naval aircraft other than the TBF Avenger or SB2C Helldiver. Typical carrier loadout rarely exceeded 20 bombs. Introduced October 1942. Capable of penetrating 5" (127mm) deck armor from a 6500' (1980m) in a 300 knot 60 degree dive. Widely used from its introduction date to the end of the war. M66 was very similar. Too heavy for delivery by naval aircraft other than the TBF Avenger. Typical carrier loadout rarely exceeded 20 bombs. Thin case bomb for razing entire city blocks. Likely saw little use in the Far East. Available in quantity early in the war. Had impact and hydrostatic fuses, the latter rather unreliable. Tended to ricochet until a nose plate was added. A flat nose version was eventually introduced as Mk 41. As with Mk 17, the original design tended to ricochet and a flat nose version (AN-Mk47) was introduced. Introduced late in the war. Moved the fuse to the tail for greater reliability. An improved version (Mk 54) with Torpex fill saw lengthy service postwar. Standardized version of the parafrag bomb. Finned version of parafrag bomb to be dropped from altitude. Fill was mustard, HS (tear gas), or white phosphorus. The incendiary version acquired a bad reputation for sensitivity. Fill was mustard, HS (tear gas), or white phosphorus. Thermate in a magnesium alloy body. Usually used in clusters of 5 with burster charge. The M54 was a version using a steel casing to economize on expensive magnesium that was dropped by the Doolittle raiders. Used in the firebombing of Japan. Usually delivered in clusters of 60 with burster charge set to go off at about 2000' (600m) altitude. Each M-69 trailed a three foot (1 meter) cloth strip that slowed the bomb and stabilized its descent. A few seconds after the bomb hit a solid surface, a small charge went off, spreading the napalm as much as 100 feet (30 meters) and igniting it. Used in the firebombing of Japan, where it superseded the M69. It used the same case but eliminated the streamer in favor of a heavier charge of napalm. It used a three-way fuse that detonated the bomb no matter how it landed, and it spread its napalm twice as far as the M69. 174 lbs (79 kg) "goop", a mixture of powdered magnesium and asphalt. Used in the firebombing of Japan, mostly by pathfinder bombers to mark targets. Known as the "block burner." Burned 3 minutes with a million candlepower. Burned 3 minutes with 800,000 candlepower. Burned 3 minutes with 400,000 candlepower. By late 1941 the other Allied powers in the Pacific were using bombs generally similar to American types or, thanks to Lend-Lease, were using actual American bombs. The exceptions included some special types that saw little or no use in the Far East, such as the Tallboy or Grand Slam earthquake bombs, which were designed to penetrate deeply underground and produce a powerful ground wave. These might have seen service in the invasion of Japan had this taken place. Bombs were not particularly effective against heavily armored ships, because these moving targets had to be attacked from relatively low altitude for there to be any chance of scoring a hit. At these altitudes, the bombs did not develop sufficient velocity to penetrate thick deck armor. As a result, aerial torpedoes were developed. Naval architects responded by developing antitorpedo systems for warships. These theoretically could allow a battleship to continue operating after one or more torpedo hits, but in practice the systems did not seem to work well. North Carolina had its forward turret disabled off Guadalcanal by a torpedo hit it should have shrugged off, and Yamato was never quite the same after a torpedo hit at the forward edge of its armor belt. The catch was that torpedo planes had to make a low, slow glide towards the target to ensure a clean drop, which left them vulnerable to fighters and antiaircraft fire. Almost all combat aircraft carried machine guns or light cannon, which were the principal weapons of fighters. Fighter aircraft sometimes attacked ground targets with these weapons (strafing), and, as the war progressed, medium bombers were often equipped with impressive numbers of machine guns to turn them into potent strafers. Experiments with heavier cannon (up to 3" or 75mm) in medium bombers were less successful because of the heavy recoil and low rate of fire. Postwar combat modelers estimated that it took two to four strafing aircraft to destroy one enemy aircraft on the ground at an airbase. Unguided rockets proved to be an effective alternative to heavy cannon, and, because they had no recoil, they could be mounted on light bombers and fighters. A small aircraft could carry six 5" rockets under its wings, giving it firepower equivalent to a destroyer broadside. These rockets were quite inaccurate, but when several were fired at once, they were able to saturated the target area. In principle, the rockets could be equipped with shaped-charge warheads for use against hardened targets, but this apparently was not attempted until after the war. P-51 Mustangs of 7 Fighter Command, equipped with 5" rockets, claimed the destruction of over 600 Japanese aircraft in strafing attacks in the final months of the war.